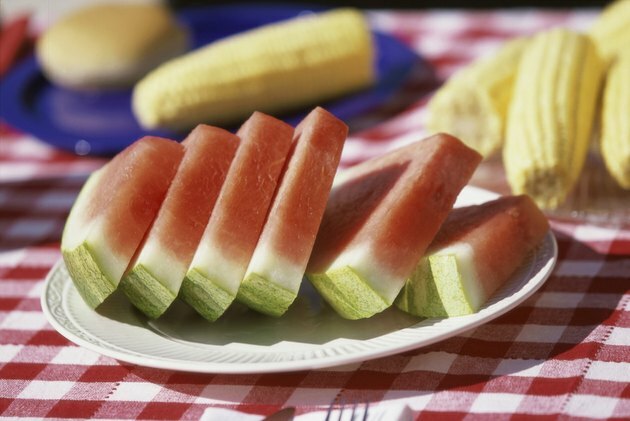 Watermelon is a summer staple served at many summertime barbecues. Infusing a watermelon with vodka or another kind of alcohol, such as rum or whiskey, turns this cool and juicy fruit into a festive treat for adults at an outdoor party or picnic. Be sure to prepare the watermelon one day in advance to ensure that the vodka is fully infused in the watermelon. This preparation is sometimes playfully called a drunk watermelon. The slices taste best when they are served chilled. It's optional to add small sprigs of mint as a garnish before plating the watermelon. Place your watermelon on a cutting board. Use a sharp knife to score a round hole in the top of the melon that is slightly larger than the top of the liquor bottle. Remove the rind from the scored hole. Using a small spoon, dig into the watermelon as deeply as possible to remove any excess fruit. Be sure to dig down at least 4 inches. Place the melon in a large bowl, positioning it so that the hole is at the top. Secure with towels, if needed. Insert the neck of the bottle of alcohol into the hole, allowing the liquor to drain into the watermelon. Leave this preparation to refrigerate overnight. Check your melon. By the next day, the alcohol should have completely infused into the watermelon. If the bottle is not yet empty, leave the melon to chill for two more hours. Cut the watermelon into quarters just before serving. From there, cut slices that are approximately 1 inch thick. Serve each slice with a sprig of mint if desired. This recipe is for adults only. Use caution when serving infused watermelon around children. How Do You Know if a Watermelon Is Overripe?